From Aberlady follow the path around the side of the golf course at Kilspindie. Then you skirt a second newer course at Craigielaw. This takes you back onto the main A198 road at the gates of Gosforth house. 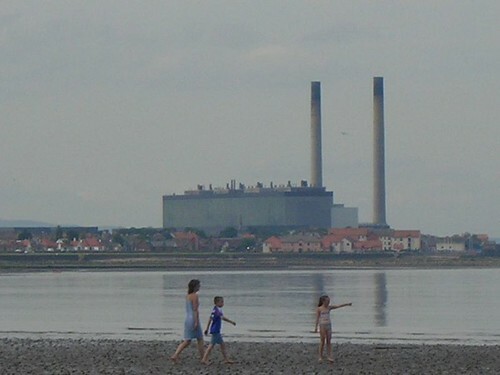 The marker which you are constantly heading for is the Cockenzie Power station, which, like its counterpart the nuclear power station further down the coast at Torness, is never out of site. Cross Gosford Bay, then Seton Sands and eventually you reach Cockenzie and Port Seton. From Port Seton head towards Prestonpans and then onwards to Musselburgh. After crossing the bridge over the Esk at Musselburgh, you pass through Joppa and then follow the long promenade next to the beach at Portobello. From the end of portobello, the walk takes you along the road to Leith where this walk ends. This was a long walk (well for me anyway!) And the furthest I have walked in one day. The weather was hot and sultry and I was glad that I had my water carrier thingy in my rucksack. Jamie thinks it is so “lame” having it, and I admit it looks like I am carrying my own drip, but its so handy to just be able to take a drink without stopping and rummaging about in my rucksack. Cockenzie, what can I say? Would look ok if they removed the massive power station, but I suppose power has to come from somewhere. The chimneys Im sure were designed to be tall enough to blow all the smoke to Norway, and I seem to remember Norway blaming us for causing acid rain and destroying their Pine Forests. The ultimate NIMBY situation. As for Portobello…a nice enough town but when I past through it, it was crammed with alcohol swigging, chain smoking chavs. How they managed to find their way there and back is beyond me. The walk from Portobello was a bit of a drag and the approach into Leith was along a long busy road with warehouses on either side so it wasnt the most inspiring of places. This entry was posted on Friday, July 8th, 2005 at 11:57 pm and is filed under Scotland, trail, walk. You can follow any responses to this entry through the RSS 2.0 feed. You can leave a response, or trackback from your own site.